I can't find anything about this oyster and think it may be rare, can anyone help by telling me the type?! I can't find any pictures of anything like this. Found in Outer Banks in local oyster at restaurant. Many pearl varieties can yield brown pearls but brown seems to be the least favorable color of pearl colors. Brown conch pearls, although gorgeous, demand a much lower price than bright pink pearls. I can personally understand this perspective and it shows in my personal wardrobe. I own one brown item, a t-shirt and it is light brown. I steer away from anything brown because I don't particularly like the color on me. I love bright summer colors. My closet looks like a rainbow! My sister, on the other hand, has more tendencies towards the fall colors and loves brown. It looks so good on her too and she loves it. It's all a matter of perspective. 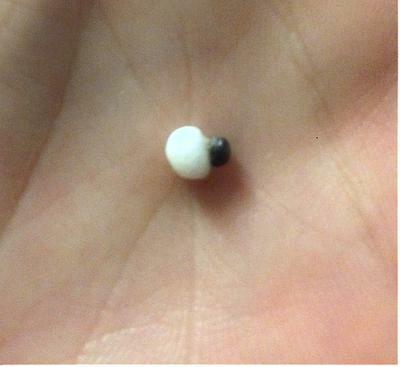 Congratulations on finding a brown natural pearl. 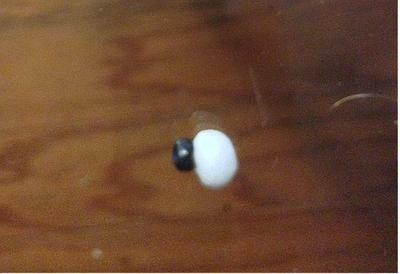 I do not know the percentages of finding a brown pearl. It seems some areas are more prone to that color than others. For example, I have lots of brown pearls from rivers in Texas, but rarely see them in pearls from say, the Mississippi River systems, so it depends upon the area and type of mollusk. The brown pearls I have from Texas lack in luster which is the most important pearl characteristic, however, a natural pearl is special because it is natural, lustrous or not. The value is different but the rarity of being natural is still there. I found a brown pearl and was wondering the percentage for finding one. I have never seen one. Yes, your pearl is very unusual. It would have value because of that to a collector. Maybe not much value because of the size but folks like unusual pearls and yours is certainly one of them. Thank you for sharing. What are the chances of that happening again...very rare.